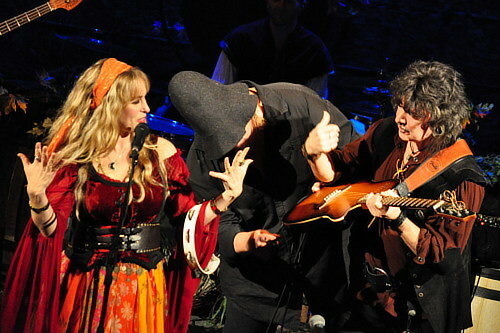 Ritchie Blackmore and Candice Night were interviewed on Rich Davenport’s Rock Show that aired on Total Rock this past weekend. They spoke (mostly) about All Our Yesterdays, which was released back in September. Ritchie reiterated that his foray into rock will be a brief one, but “if it works”, more dates could be added. When I play rock all the time, I play with a plectrum, and now that I play this style, I’ve adopted a different finger style way of playing; I have to grow my fingernails so long, and it becomes very awkward if I’m playing electric. That’s quite a challenge in itself. […] In rock, I was just kind of churning out heavy metal riffs and it was becoming stale and kind of redundant what I was doing. I got kind of bored with the whole thing. Now I’m always sitting with a guitar and playing finger style when I’m trying to come up with new ideas and progressions, and it’s a very natural process. Whereas I felt that in rock, it was becoming contrived. We’d need to rehearse and it would have to be a hard rock, riffy number, and [I felt like] I was starting to just repeat myself in a way. I feel at home playing both styles — whether it’s finger style or electric. I just like the difference. It’s almost more of a challenge to go on stage and play with an acoustic guitar very quietly. For me, that’s a lot harder than the rock style, ’cause [when you play heavy rock], you rely on the amplifier to kind of excite people and turn up the energy. When you’re playing acoustic, you’ve gotta try and excite and move an audience with just technique, and I find that a lot harder. But it’s very rewarding. When it works, it’s great. Blackmore’s Night will go on, and this is just a brief intermission of playing some good old rock, but with some good friends and some good musicians. And hopefully everybody’s there for the same reason, which is it’s good music and it’s nostalgia, and hopefully everything goes well. And if it works, we’ll do, obviously, more dates. We’re only doing three this first time. But, like I said, if it works, we’ll do more later on. And in case anybody had any doubts that Blackmore’s Night will go on, tickets for two German shows next July are already on sale. Posted by Nick Soveiko on Tuesday, December 15th, 2015, filed under News. You can follow comment on this post through the RSS 2.0 feed. You can skip to the end and leave a comment. Pinging is currently not allowed. Pray that it goes well and some more dates are added!!!!! that is great news,if it happens! Hopefully will be inspired enough to go in the studio and make a rock album! That’s too bad. The albums are always hit ‘n’ miss. I prefer the disastrous* House of Blue Light over any Blackmore’s Night album. * as Ritchie called HOBL recently. I was hoping the story might be about BN taking a break for a year or two! However, it is great to hear Blackmore is keen to rock on a little further though, with the ‘new Rainbow’! Probably as a result of the rehearsals perhaps? Good idea to get together early & crank it up, see who is playing what & how it all sounds etc! Hooray! Cheers. If young “Hot” Ronnie can handle it, if the fans buy it & should your guitar slinger not get sick & tired of the whole idea….. I remember that fairly recently there was a fellow by the name of Linton Osbourne from a covers/tribute band that went on to front the classic rock band Nazareth. I thought he sounded alright, but the fans tore the poor man’s confidence to pieces, so consequently, Linton became unwell & left the band & was then replaced. The 2016 Rainbow with Ronnie will do just fine, be positive!. Well mister blackmore, if it is possible could You come over to do a concert in Bordeaux or Toulouse. That would be great, Thanks for all your beautiful music.